You can now order it on AMAZON! Thank you so much for the translation. finally we can hear his voice and understand it. Thank you for giving the opportunity like me to read the poetry of Ashraf Fayadh. Thank you for these translations. His metaphors about the dark, underbelly of oil are powerful. I hope that he will be released, that this campaign will help shift the court. will there be more translations , is there a place where i can read them all? It is wonderful to read these poems that interrogate the ethics of oil. Would love to read more. Where is the blasphemy he is being charged with? Very interesting the poems of Ashraf Fayadh,Palestinian Poet.His poems are very existencialistic,full of imaginary reality,directing us to awake ,to see the reality, the greed of oil in our time...I cant comprehend why he is arrested and send to jail & death ,just to create ART..Its a doble standart in Saudy Arabia...on relation to Art,Life,Religion.... Mr Fayadh shall be release from Prisson and move to America where he can grow freely as a poet,as an artist ,and as a great Human being. !!! 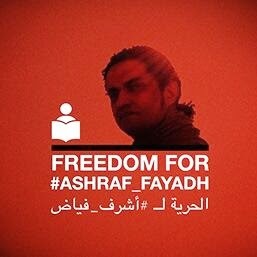 FREE ASHRAF FAYADH!!!!! This new Saudi king is over 70 - he had been waiting until old age to take the throne, boy he is sure going to unleash his frustrations and wrath over his subjects and surrounding nations (Yemen) ... Please God Help Us All, Amin. Wonderful works - million thanks to Mona. Poems are more than blasphemous as the poet dared to use word 'oil'. No Tolerance on State Intolerance. Thank you Mona for introducing the poet. Thank you for English translations. We will read out his poems in his honor on Dec 17 here in Albuquerque New Mexico USA at the community gathering "Resolana Luz" in our South Broadway Cultural Center. The New Mexico Revolutionary Poets Brigade salutes Ashraf Fayadh and his courage! Just wanna say... thanks for good translation... lovely poem, anyway. What a privilege to read this poets words. Thank you for making Ashram Fayadh's work available to this fellow poet from the United States. An honour. Beautiful peaces! I pray for his freedom! Hello and greetings from Portugal! I made some translation of a few Ashraf's poems in portuguese. And now I'm doing the translation of the rest of them, using your translation from here. I'd appreciate very much if you could help me in some meanings. As far as I know there are no portuguese translations at the moment and it would be great to have some Ashraf's poems for people to have "access" and know better Ashraf and his unique and free mind! My idea is to spread his words on paper and web. Also, this is the most I can do right now... And as much translations we can have stronger Ashraf's voice becomes! Translation of this poem in our Nepalese languages are given in digital media widely in Nepal. Translation of these poems in Nepalese are put on digital media of Nepal also. من رائحة المال و النفط! الهذا قفزت في النار ؟! الآن صوتك محصور في القلب و كل قصائدك الجديدة هي الجمال بلا مأوى ! الشمس المشرقة ترتفع و تستمع الى شعراء العالم يدعون اسمك. Hello, If you don't mind I'll post this translation on Facebook, properly quoted and with a link to your blog. I found this really interesting, thank you for your work. I hope this poet to be released the soonest possible from prison, anyway he was in an intellectual prison (the Saudi Regime). I hope the best for him and for you too. Kings, Courts and Mullahs of the Land of Oil say the poet must die? It's not the poet who insults the prophet! It's not the poem that insults Islam! Who then is guilty of apostasy in the land of black gold, sun, wind and sand? False teachers who understand the Prophet and Poets words not! Like many of you, I cannot find any offensive thoughts. Ashram Fayadh must let go free. Beautiful, thank you for the translation. I hope that these are not the poems that will cause this poor man to spent 8 years in prison and receive 800 lashes. I see no apostasy, just powerful words. But then I am just a stupid American who believes in free speech. Thank you Mona!! I'm working on a french translation. This is not blasphemy. This man is innocent of what they are accusing him of. I don't know of a single hadith where prophet Muhammed (pbuh) punished someone with 800 lashes, where do they come up with these rulings? This is purely a political action. They apparently did not like the fact that he is critiquing the rich Saudi Oil business that leave a large section of the population still in poverty. Great poem. Shame on the king. The soul can only renew "the-self" by taking journeys from life's daily drudgery. By looking inward further, examining, querying life's purpose it thus clarifies and liberates itself to find hope at the end of the tunnel. 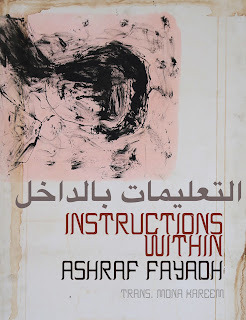 The translated Ashraf Fayadh's poems that I read, are the voice of an artist who dares to begin that needed inward search to understand life and to inform others. The clarity of its reach may have unnerved the exteriors of a paternal structure whose strength is in droning its populace into sleep, done sometimes with horrific public acts such as lashing and executions. But is Ashraf's art enough repudiation of that paternal structure that the poet must be sentenced to die? Ashraf is not Rushdie! But his case sure brings up what RUSHDIE suffered. Rushdie. I hope your voice still counts? I hope you can see a parallel here if you haven't - enough to come to the aid of this nascent voice made a sacrificial lamb. Help must be found and given where it is needed. And this is the right moment to help stir up or support a movement that will free art and artists from the din of ignorance that's often the stature of a closed-society. Let the free world arise to help Ashraf! Please don't STOP until this good and clear poetic voice is liberated to find its own lights in this vast universe.